According to the old wisdom, the two happiest days of a boater’s life are the day they buy a boat and the day they sell it. There’s also an argument to be made for the day when a generous friend buys one. Boating, from the sun to the breeze to the prestige, is a lot of fun. The part where you have to store the boat, stay on top of the maintenance and drive in reverse with a trailer behind you is not. Luckily there are many ways to enjoy Tampa Bay’s beautiful waterways on a boat this summer without owning a vessel, or even knowing a guy who does. The Clearwater Community Sailing Center (clearwatercommunitysailing.org) keeps about two dozen first-come, first-serve dinghies (pictured above) and catamarans available to members for sailing a scenic, 4-mile stretch of the Intracoastal Waterway. These small sailboats without a keel are most comfortable for two to four people. Individual memberships are $400, or $525 for families, and you can bring nonmembers along for $5. Not a bad deal considering renting their boats by the hour (another option) adds up to a year’s membership after just five or six hours, and you’ll also get access to their fleet of kayaks and paddleboards. Members get a $50 discount on the two-day learn-to-sail class ($150 for nonmembers), and the added comfort of knowing a center staffer will come to assist you if there’s trouble on the water. The St. Petersburg Sailing Center at the St. Petersburg Yacht Club (sailstpete.org) has a similar setup where members get access to a fleet of Shumway Marine Ideal 18s — 18-foot keelboats available for unlimited day sailing in Tampa Bay between the St. Pete Pier and Albert Whitted Airport. Individual memberships are $350 a year. If you decide you’d like to try your hand at racing, the center offers an informal Tuesday night racing series in those same boats, available to members at no cost. Both the Clearwater and St. Petersburg centers require you to prove a basic ability to sail before you can take their boats out. If you’re not there yet, both centers offer classes. The same way Airbnb and Uber connect you to owners willing to share what they have to make some extra dough (homes and rides, respectively), tech companies are doing the same with boats. 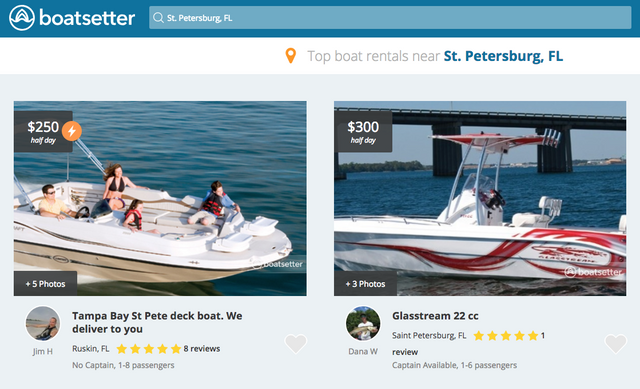 Boatsetter looks incredibly similar to Airbnb, with reviews from previous renters and lots of filters to play with. On boatsetter.com you can filter by price, number of passengers and whether you want power or sail, but also by small details such as whether there’s a live bait well, rod holders or Wi-Fi. Most importantly, you can filter searches by whether the boat comes with a captain, or you can drive it yourself. Recent local listings ranged from a 43-foot Viking Yacht certified for 20 passengers for $1,800 per half-day with a crew, down to a 19-foot Hurricane deck boat for $275 a day with no captain. GetMyBoat is a similar service that also includes kayaks, paddleboards, water scooters and more for as little as $15 an hour. Browsing the listings for the Tampa Bay area brings up captained tours and fishing charters you can find elsewhere, but there are some boats available to take out on your own. The GetMyBoat app works with iOS and Android. If the experience of living aboard a boat without actually leaving the marina is enough for you, vacation rental providers Airbnb and VRBO both have listings for boats. 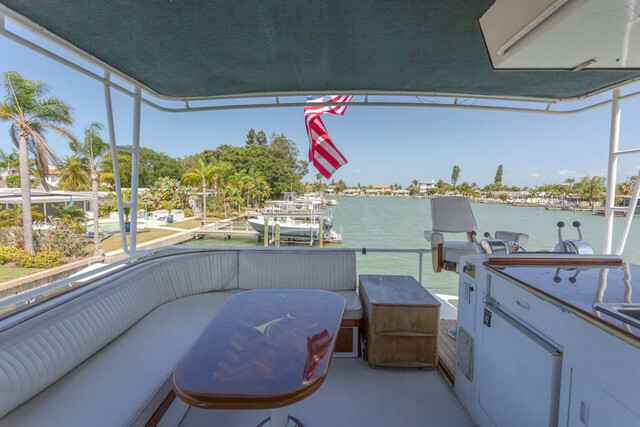 There are dozens of listings in Tampa Bay from a 61-foot yacht docked behind a private home in Treasure Island to an old houseboat at a marina in Tarpon Springs that allow you wake up surrounded by water. Membership in Freedom Boat Club, right, (freedomboatclub.com), sometimes referred to as a "boat timeshare," has been growing fast. The company now has 17 franchises on various Tampa Bay waterways and more than 100 locations around the world. You pay a one-time fee of $3,000 to $3,900, plus monthly dues, so this option is for people willing to pay more for ongoing access to newer, bigger and better boats in various locations. 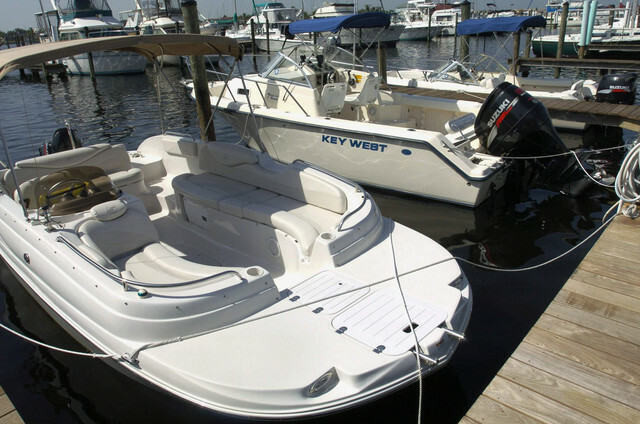 You can get unlimited access to a fleet of more than 100 boats from 19 to 24 feet in Tampa Bay, including pontoons and deck boats for pleasure cruising and center consoles ready for off-shore fishing action, plus limited access to their boats in other regions. Their pitch: In 10 years you’ll have spent less than the outright purchase cost of some boats, without having spent any money or time on maintenance, storage or launching, and your boats are always new or close to it. Prefer to let someone else drive? Many local boats will take you for a cruise. The Pirate Water Taxi (piratewatertaxi.com) servicing 17 stops on the Hillsborough River along Tampa’s downtown waterfront lets you hop on and off all day for $20, $10 for children, checking out downtown attractions, and you’ll get a gorgeous view of the illuminated bridges once the sun goes down. If you want something mellower, classic and romantic, Tampa’s Olde World Sailing Line (oldeworldsailing.com, toll-free 1-888-989-7245), departing from the docks at the Tampa Convention Center, offers three-hour sunset sails and "full moon soirees" aboard the 44-foot S.V. Lionheart sailing yacht (think teak, mahogany and polished brass oil lamps), featuring hors d’oeuvres, bubbly and a crew member playing a harp, for $96 to $116. 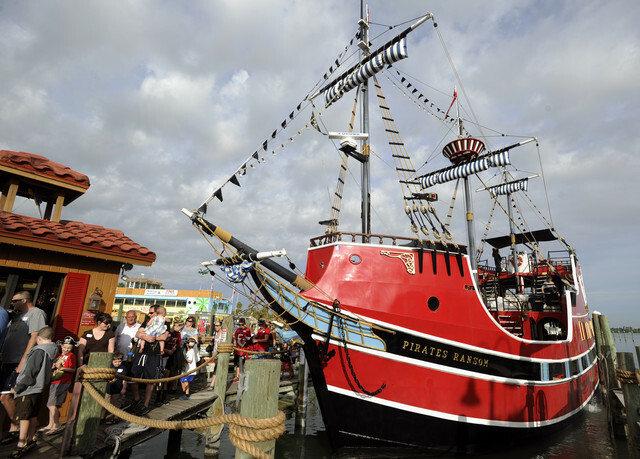 Excite your kids with a ride on a full-size pirate ship by booking a voyage on Captain Memo’s Pirate Cruise (captainmemo.com, (727) 446-2587), which departs from the Clearwater Beach Marina. Prices range from $11 to $36 and cruises into the gulf include pirate stories, face painting, dolphin spotting and complimentary beer or wine. If you prefer a set destination, you can only reach the 1,800-acre Shell Key Preserve, featuring some of the area’s best birding, shelling and beach lounging, via boat. The Shell Key Shuttle (shellkeyshuttle.com, (727) 360-1348), departing from Merry Pier in St. Pete Beach, will get you there for $25 round trip. They also do sunset cruises that tour the residential waterways and barrier islands of Pass-a-Grille. The Caladesi Island Ferry (caladesiferry.org, (727) 734-5263) from Honeymoon Island State Park to another pristine barrier island beach, Caladesi Island State Park, runs every day except Thanksgiving and Christmas for $14 round trip. A new option is the Madeira Beach Ferry (tampabayferry.com, (727) 398-6577) from St. Petersburg’s Jungle Prada de Narvaez Park making stops at John’s Pass, Treasure Island and Madeira Beach. A day pass runs $19.50, or you can take one ride for $10. There’s also a ferry to Egmont Key from Fort De Soto (tampabayferry.com, (727) 398-6577). It costs $20 for adults and $10 for children 3 to 11 and is free for kids 2 and younger. If you’re more interested in sunning alligators, turtles on logs and shady forest canopy than you are dolphins and salt water, try a peaceful paddle on the Hillsborough River. There are several parks in the Lower Hillsborough Wilderness Preserve, a 16,000-acre protected recreation area north of the University of South Florida in Tampa. You can rent a first-come, first-served canoe from the county at Lettuce Lake Park (hillsboroughcounty.org/locations/lettuce-lake-park, (813) 987-6204) for $25 for up to four hours. 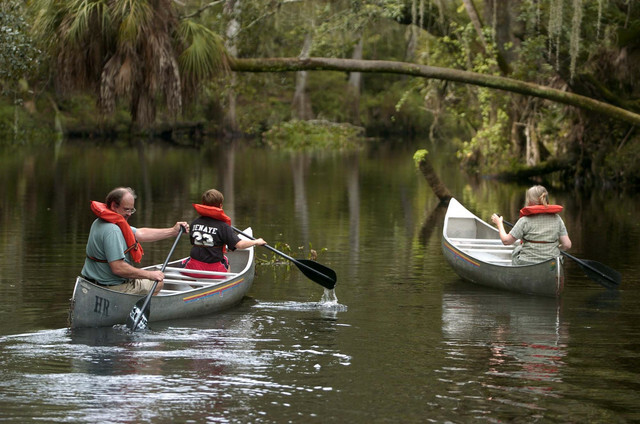 Canoe Escape (canoeescape.com, (813) 986-2067) offers four different downstream trips in the preserve, between Sargent Park, Morris Bridge Park, Trout Creek Park and Rotary Park, with a shuttle back to your starting point at the end. Reservations are required. For around $60 to $90 an hour, you can captain your own electric boat with a roof for shade, a big cooler for beverages and comfy wraparound couches for up to 12 people while touring the downtown waterfront and puttering past luxurious private homes on Davis Islands, including Derek Jeter’s. You’ll find eBoats (eboatstampa.com, (813) 767-2245) docked behind the Tampa Convention Center. Anyone 25 or older with a driver’s license and credit card can drive one. 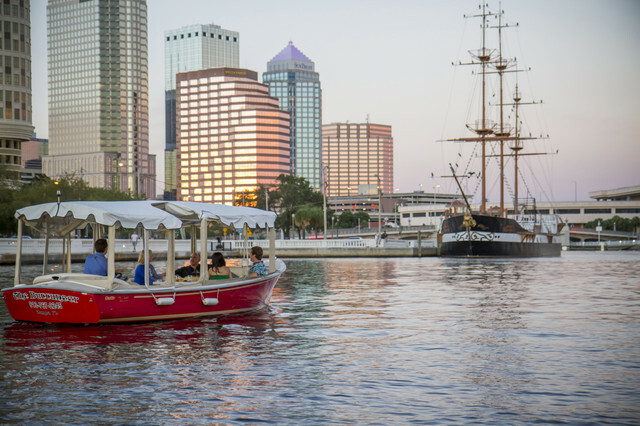 eBoats offers electric boat rentals on the downtown Tampa waterfront. You don’t have to be a student to take sailing classes through the University of South Florida St. Petersburg’s recreation department. USFSP’s Start Sailing Right program offers group classes that will get you sailing on the school’s fleet of Flying Junior dinghies. The program is $85 for students or $225 for nonstudent locals. They also offer a Start Powerboating Right program. They haven’t finalized the class schedule for the summer yet, but will post it and offer registration soon. (usfsp.edu/campus-recreation/sailing-lessons, (727) 873-4589). Editor's Note: This story was updated to reflect that eBoats can carry up to 12 passengers. A previous version misstated their capacity.